Today I found another little gold star in the Etsy Treasury! 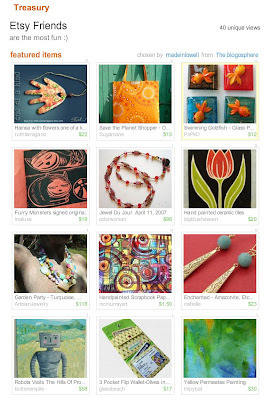 Even sweeter, though, is the title: "Etsy Friends." The cockles of my heart are all warm and cozy. madeinlowell created the treasury. She is a wonderful polymer clay artist and hilarious individual. I made her acquaintance in an Etsy forum thread about poetry devoted to a mysterious Bow Tie Kid in her second grade class. Check out her Mill Girl blog! I was just going to offer congrats, when in your little screen shot, i was my very own necklace out of the corner of my eye while I was reading that Madeinlowell was the curator and was just saying to myself - she's my friend too. People like you two are making this whole experience rich and fun!